Time is running out! We still have lunch, cart and hole sponsorships, and foursomes available. The 2013 OSF Healthcare Peoria Area Chamber of Commerce Golf Outing will be on September 19 at the Country Club of Peoria! Contact us before 5 pm on Monday (Sept. 16) to reserve a sponsorship and before 5 pm on Tuesday (Sept. 17) to reserve a foursome. 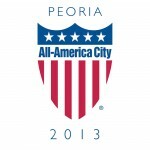 Contact Jolene Cole by e-mail at jcole@peoriachamber.org or by phone at 309-495-5923.